- Season your steaks with just salt and pepper and sear on a high heat for a minute each side in olive oil. - Once the steaks are seared add one glass of good white wine to the pan and finish the steaks to how you like them. 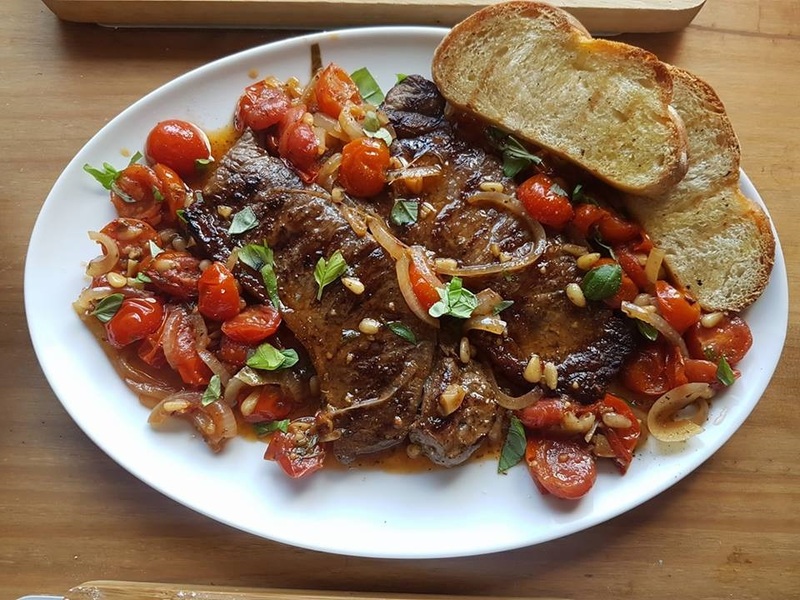 - Add 1 sliced chilli, 3 sliced cloves of garlic, 2 sliced anchovy fillets, 1 tbsp of chopped capers, and half a thinly sliced onion to the pan with a handful of chopped oregano. - Add 200 - 250g of halved piccolo or cherry tomatoes (or which ever you prefer really!) to the pan. - Reduce the heat, cover and simmer for 10 - 12 minutes. - Re-add the rested steaks, turn the heat down low and leave the steaks in the sauce on a very low heat for about 2 1/2 to 3 mins. - Serve with a small handful of fresh basil, a drizzle of olive oil and some slices of crusty grilled bread on the side.